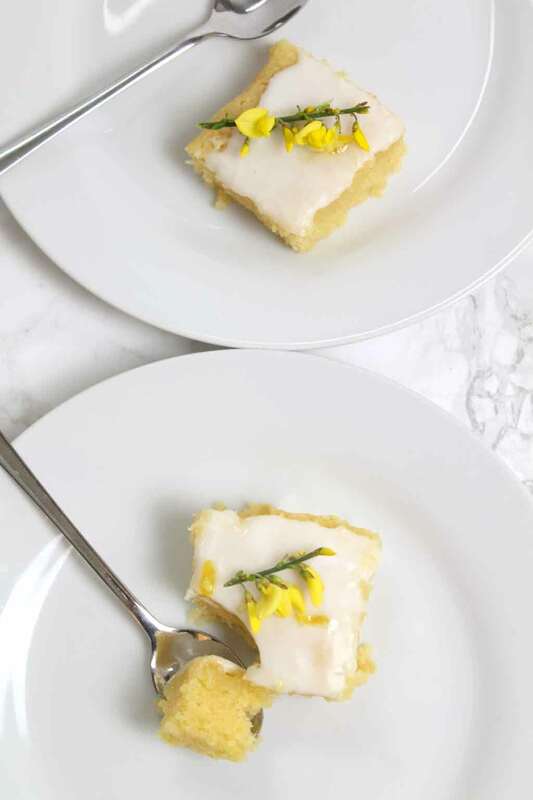 You’re going to love this vegan lemon drizzle cake! It’s very moist but at the same time, light and airy. Just how good lemon cake should be! I first created this recipe on a whim last summer. I was pottering around the kitchen and threw some ingredients in a bowl, hoping it would make a delicious vegan lemon drizzle cake. I actually shocked myself that it was that easy! Usually, when I’m experimenting with new recipes for the blog, it results in AT LEAST 1 or 2 failures first. And a lot of wasted time and ingredients. And the taste is absolutely perfect! It’s super moist inside but still has that airy, crumbly texture that you’d expect from a cake. I amended my original recipe slightly to include some thicker icing on top. As much as I love it with just the drizzle, the texture of the icing and the sponge together tastes incredible! 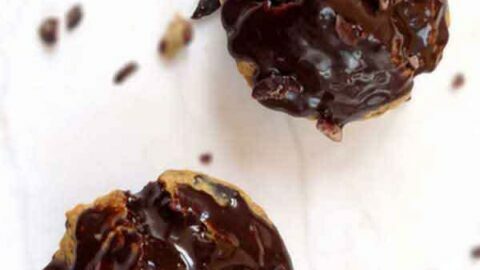 If you’re new to baking vegan desserts, you might be wondering how to bake without eggs or dairy. But I promise you, it’s SO easy! 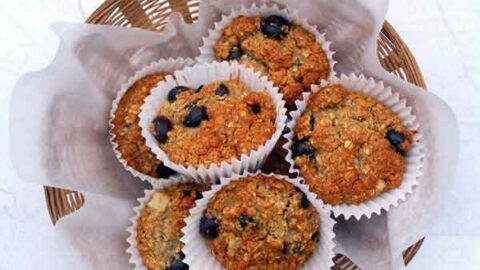 For this recipe, I simply used vegan butter instead of dairy butter, and plant-based milk and baking powder instead of eggs. 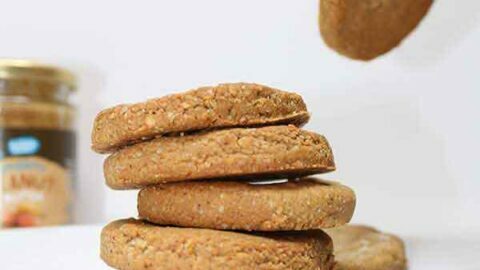 The baking powder gives the leavening effect that eggs have, and the milk adds the moisture. This is perfect for helping the other ingredients in the cake bind together! The first step is to “cream” the butter and sugar together. 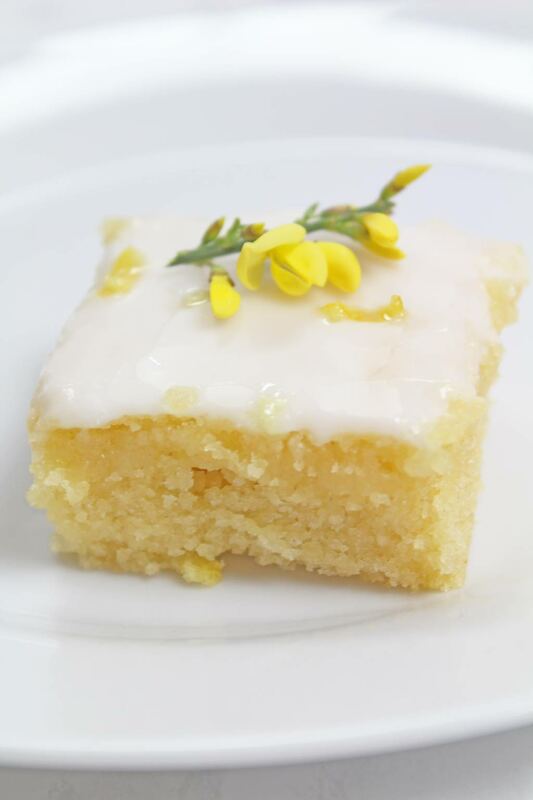 I used a vegan butter replacement for this lemon drizzle cake which was a super simple switch. The consistency and flavour is exactly the same (none of my non-vegan family can tell the difference!). 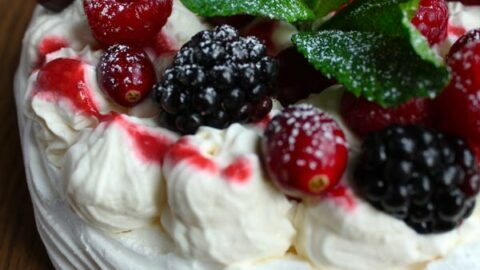 The term “cream” in baking basically means just to create lots of air between the butter and sugar. All you need to do is smear the butter along the sides of the bowl with your spoon until the sugar is completely combined. It will be a pale yellow colour with a light and fluffy texture when done properly. Fold in your flour. The easiest way to fold flour into a cake mix is by doing a figure of 8 with your spoon until everything is combined. Folding the flour allows us to keep as much air in the cake as possible so it doesn’t come out too dense once it’s baked. Next add your baking powder, lemon juice, and plant-based milk. Fold everything in, add in some lemon zest and fold again. 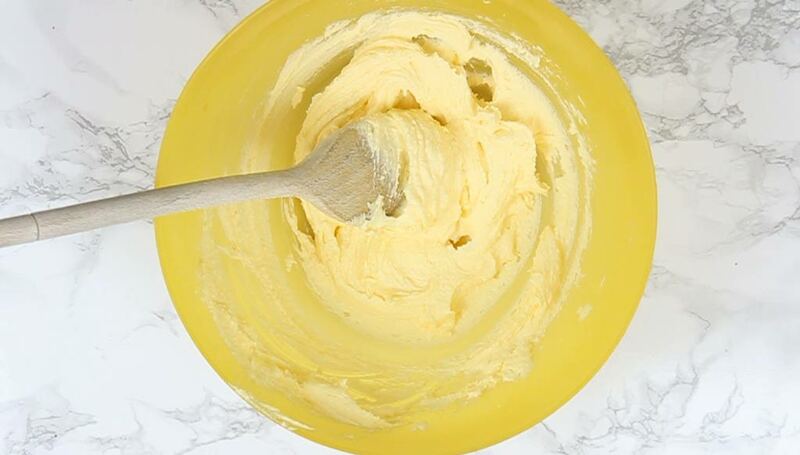 You should end up with a smooth and creamy cake batter. Pour the cake mixture into a tin. For this recipe, I used a 23cm pan. This is simply because you can squeeze more servings out of a rectangular pan than you can from a loaf tin! The cake should come out light golden brown. You can test if it’s ready by putting a skewer or small knife into the center of the cake. If it comes out clean, it’s ready. If there’s still some cake mix on the skewer/knife, pop the cake back in for a bit longer and repeat as necessary. Prepare your lemon drizzle. 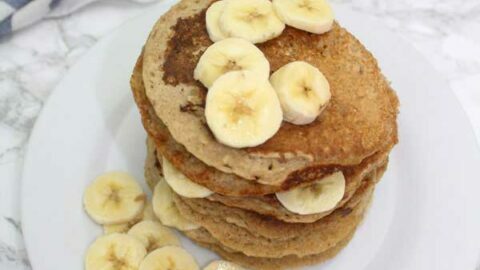 To do this, you just need to mix some lemon juice with caster sugar. Pour this over the cake as soon as it comes out of the oven, while it’s still in the tin and still hot. Once the cake has cooled completely, you can remove it from the tin and either place it on a wire rack or on a plate. 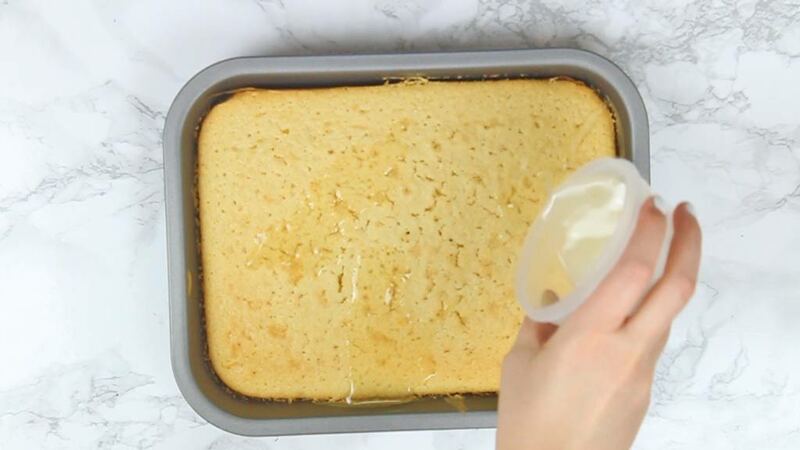 Pour your lemon drizzle over the cake while it’s still hot. 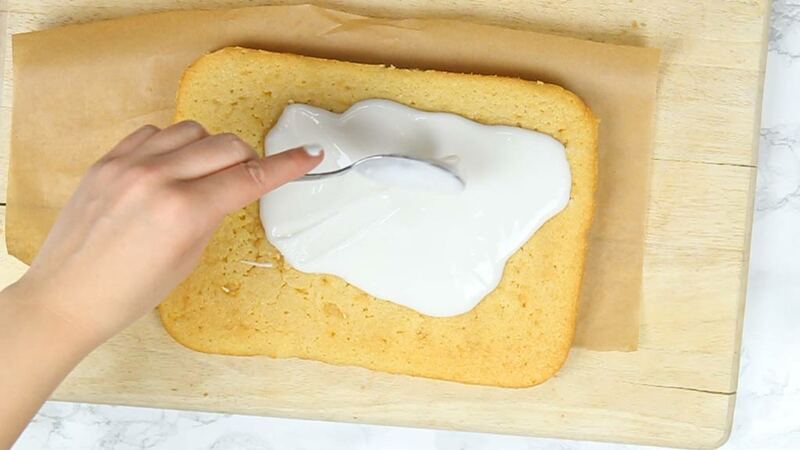 Step 5 is to prepare your icing! You can totally miss this step out (the cake still will taste amazing) but I love the extra dimension the icing brings. Just mix the icing sugar and water together, then spoon it over your cake. Top with some extra lemon zest if you like, and you’re done. The best vegan lemon drizzle cake ever! 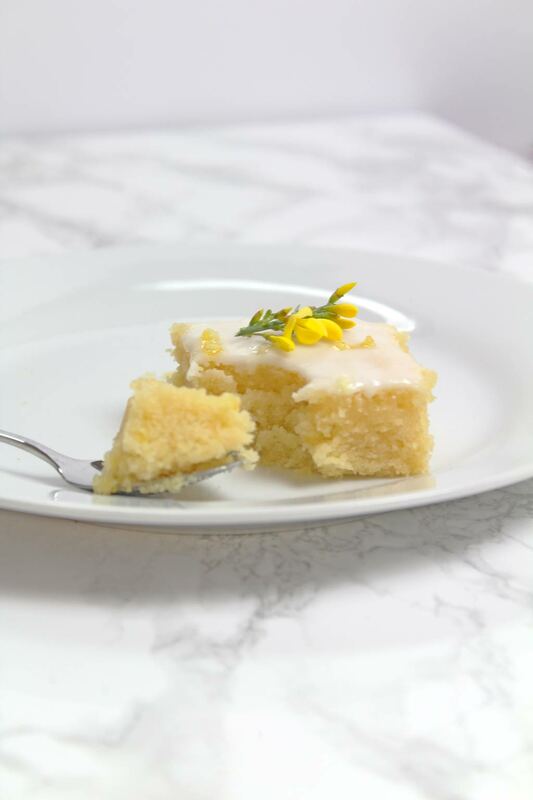 Can I freeze vegan lemon drizzle cake? 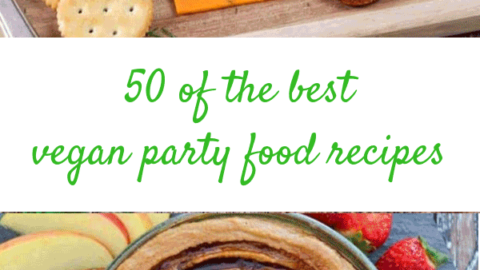 Yes, this recipe can be frozen! Just make sure to freeze it WITHOUT the icing. You can make this on the day, just before serving. 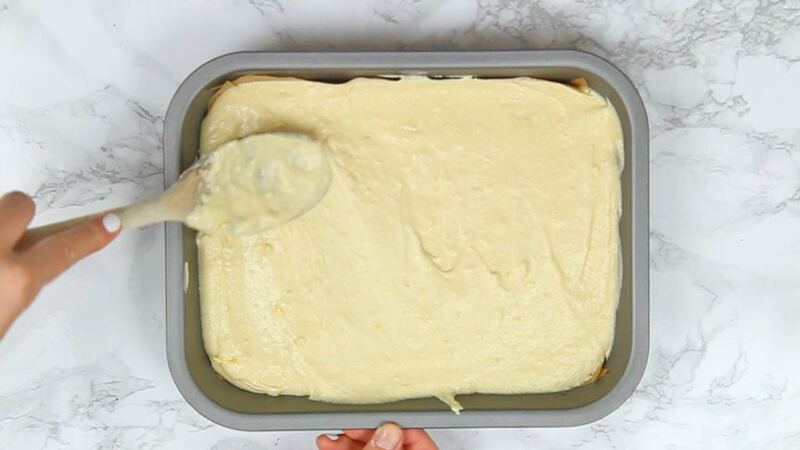 Once you’ve added the drizzle and the cake has completely cooled, remove it from the pan and wrap it in plastic wrap. 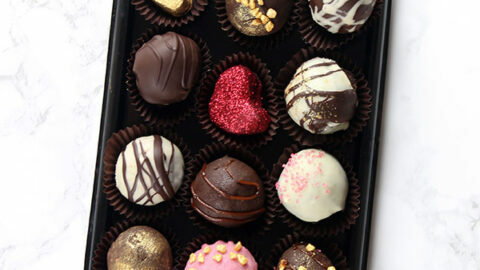 Then place it in a freezer bag or some foil and freeze for up to 2 months. To thaw the cake, unwrap it completely and leave at room temperature for 4 hours. Let me know if you try this recipe by leaving a review below or tagging me on Instagram @bakedbyclo! A deliciously moist lemon drizzle loaf cake that's vegan-friendly and tastes just like the classic. Preheat oven to 180°C / 350F / Gas 4 and line or grease a 23cm pan. Cream together sugar and butter. 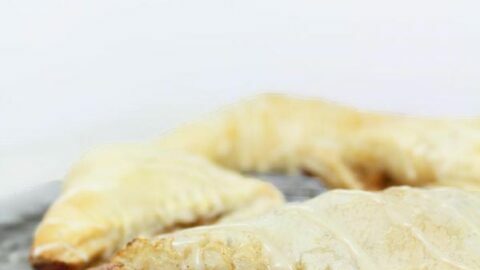 Fold in the flour, baking powder, lemon juice, and milk. Spoon the mixture into the pan and bake for around 40 minutes until golden brown. A skewer/knife will come out clean. 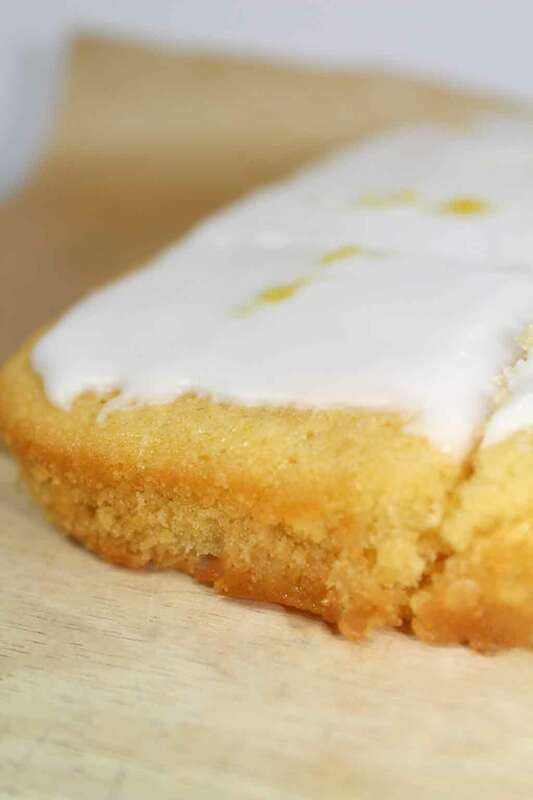 While the cake is baking, make the drizzle by mixing together the lemon juice and sugar. Pour this over the cake as soon as it comes out of the oven, while it's still hot. When the cake is completely cool, remove it from the loaf tin. 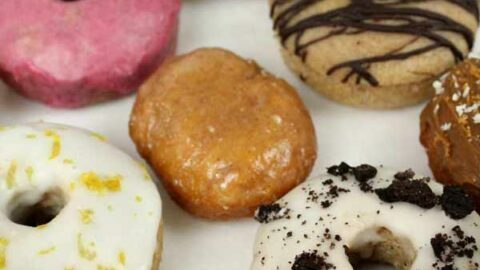 Prepare your icing by mixing the powdered sugar and water together. 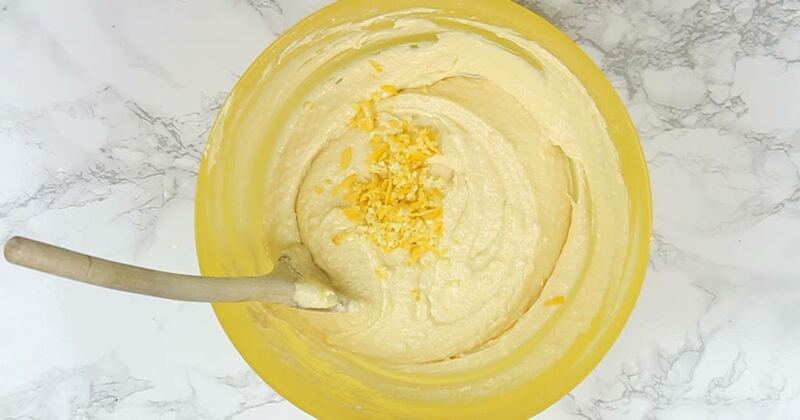 Spoon the icing over the cooled cake and top with additional lemon zest. 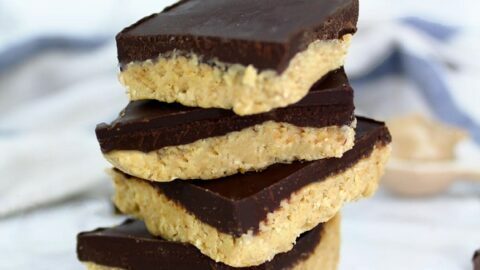 Leave the icing to harden for around 30 minutes or so, then cut into squares and enjoy! ***Sub any other plant-based milk. *Can be stored in an airtight container for up to 5 days.